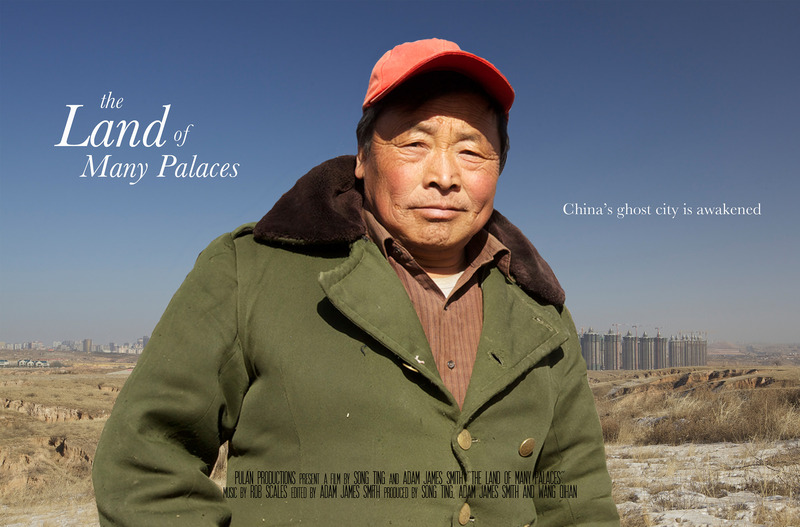 On campus to screen his documentary The Land of Many Palaces, Adam James Smith discussed the Chinese ghost-city Ordos and the urban migration of millions of Chinese farmers. PROVO, Utah (February 24, 2015)—In Inner Mongolia, a northern autonomous region of the People’s Republic of China, along China’s border with Mongolia, there is a city called Ordos. The city boasts state-of-the-art government building and business towers, modern theaters and museums – but the well-paved streets and smooth sidewalks are ground to hardly anyone. Ordos, which is one of the first purpose-built cities in a rural region in the western part of China, was designed to accommodate one million people, and yet it’s nearly empty. The Land of Many Palaces, a documentary film directed and produced by Adam James Smith and Song Ting, and co-produced by Wang Qihan, follows a government official as she tries to convince rural farmers that their lives will be better off in the city. The film also depicts a farmer in one of the last-remaining regional villages who is pressured to move. The Chinese government now plans to build hundreds of these new purpose-built cities all across the country. Just like in Ordos, farmers will inhabit the cities. “What interested us is how do you take people who have no experience of living in a city and put them in a city? How will that work? How will they adapt to urban life? What kinds of occupations will they have? How will they live around each other in an appropriate way? And will these kinds of cities thrive? Can they have a thriving economy and a thriving populace who are engaged in honorable occupations?” Smith said. Smith and Ting were keen on having a government worker in the film because they wanted to show the two prominent perspectives of the situation: the perspective of the government and the perspective of the rural farmers. Her leader approved the film, although they did have to get each scene involving Xiaomei approved by her leader. Workers in the city’s propaganda department approved of their project because previous press about Ordos focused on the city’s seeming shortcomings: that is, it was a ghost-city, it was empty, and it was a failure. The purpose-built cities offer classes on all of these subjects to help ease the transition from rural to urban. “They’ve introduced all sorts of classes and educational programs to try and educate these people on how to survive in the city,” Smith said. According to Smith, if the central government is successful in its pursuit to relocate 250 million rural farmers to purpose-built cities in the next fifteen to twenty years, this movement will constitute the largest and fastest rural-urban migration in the history of the world. Historically known as “the land of many palaces,” due to the palatial-sized tents erected in the region by Mongol warriors, the area of Ordos is once again a land of many palaces: an entire city occupied by21st-century mansions, waiting for its residents to follow. 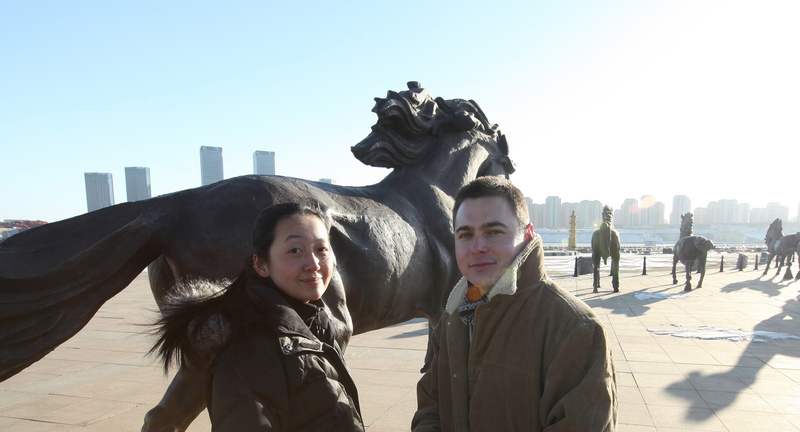 Filmmakers, Song Ting and Adam James Smith, at the lakeside plaza, opposite Ordos Central Business District, Ordos, Inner Mongolia. November 2012. 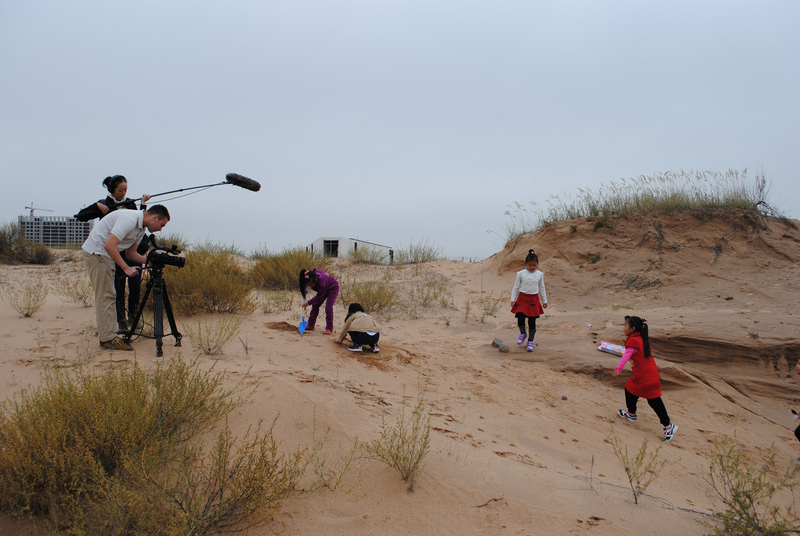 Adam and Ting shooting children playing in the dunes at the abandoned Ordos 101 project, originally initiated by Ai WeiWei. Kangbashi, Ordos. October 2011.